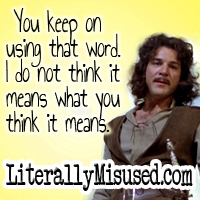 This site is lovingly dedicated to anyone and everyone who has ever been driven out of their minds by the misuse of the word “literally.” No, it is not literally raining cats and dogs. Your customer was not literally from hell. You are not literally peeing your pants from laughter as you browse this site (and if you are, please see your doctor immediately). If you’re confused and not sure why this is so entertaining, fear not. Take a deep breath and read on. b) Containing many figures of speech; ornate. Did that clear things up? If so, you are on your way to being as annoyed as the rest of us by this ignorant epidemic. If you still don’t know why this might be funny go ahead and scan the site. You might just find yourself quoted. Feel free to submit your own photos, screenshots, videos, songs, stories or whatever you have. It does not literally mean the world to us, but we appreciate them nonetheless. To all you grammar geniuses out there: You make us tremble. We bow to you. We are not worthy.